This is a simple, delicious recipe. Serve the salmon with buttered baby potatoes and a lightly dressed green salad for the perfect midweek meal. Preheat the oven to 180oC/gas mark 4. Lightly oil a baking tray or line with non-stick baking paper. Place the breadcrumbs in a bowl and stir in the lemon zest and chives. Spread a thick layer of cream cheese on the salmon fillets and place on the prepared tray. Top with the flavoured breadcrumbs, lightly pressing them into the cream cheese to help them stick. 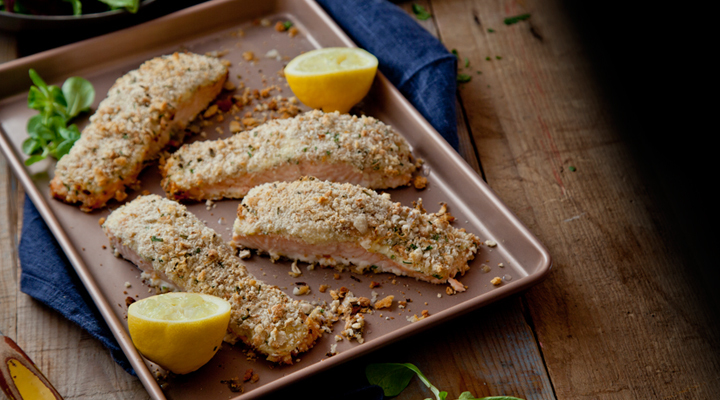 Bake in the oven for 20 to 25 minutes, until the salmon is cooked through and the breadcrumbs are crispy and golden. Meanwhile, cook the potatoes in boiling salted water until they are cooked through and tender and the point of a knife slides through easily. Drain well, then put back in the pot with a knob of butter and a pinch of salt and pepper, tossing to coat all the potatoes in the melted butter and the seasoning. Serve the salmon with the boiled baby potatoes and a green salad on the side and garnish with a lemon wedge for squeezing over.